From Tricks, Co in Japan, comes another interesting method for a demonstration of double clairvoyance. This one takes the old X-ray deck concept to a new level by also combining it with a force deck principle. The result is a very baffling double card revelation. 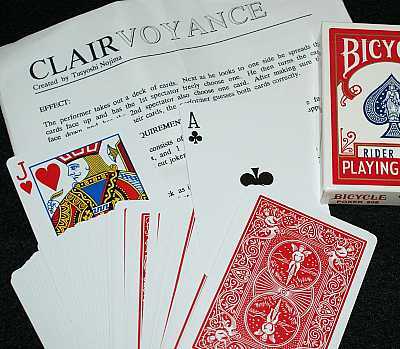 Two spectators select cards from this specially gimmicked deck, the cards are fairly returned into the deck (no breaks or controls), and the magi instantly names both cards...just like Clairvoyance! The routine that comes with the deck can be simplified (in my opinion) to make this more effective...so when you buy this, try this way: one card is peeked, and another is slected and replaced. Keep your head turned away throughout so it is obvious no glimpses or peeks. Show the deck squared up all around, to preclude any ideas of breaks or controls. Cut the deck once and name both cards. The other magi at the club meeting will respond with stunned silence!